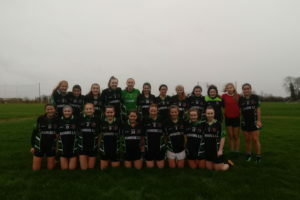 In horrific conditions, Dunmore played Ballygar in their Senior girls’ football campaign. Bitterly cold with strong gusts and stinging heavy rain and sleet meant that this was going to be no easy task. Playing into an unwavering breeze in the first half challenged our girls with many of our shots falling short into the goalie’s hands as well as forcing our girls to work harder at carrying the ball with passes being unreliable and unpredictable. At halftime, we saw ourselves down by 5 points with the score reading 1-10 to 1-5 to Ballygar. The determination and positivity of the Dunmore ladies were not to be quashed however and the second half saw a revitalised Dunmore team with some beautiful passages of play. Having the advantage of the wind at our backs definitely helped spur the team on. Early in the second half Dunmore took their scores with confidence and drew the game level. However, clenching those winning scores was just out of grasp and the game remained nail-bitingly tense as the teams remained level yet both made strong attacks. Special commendation must be made to the girls on their defence all over the pitch as many advances were foiled and the ball recovered. In fact, so good was the defending and reading of the game that Dunmore held Ballygar scoreless in the second half.